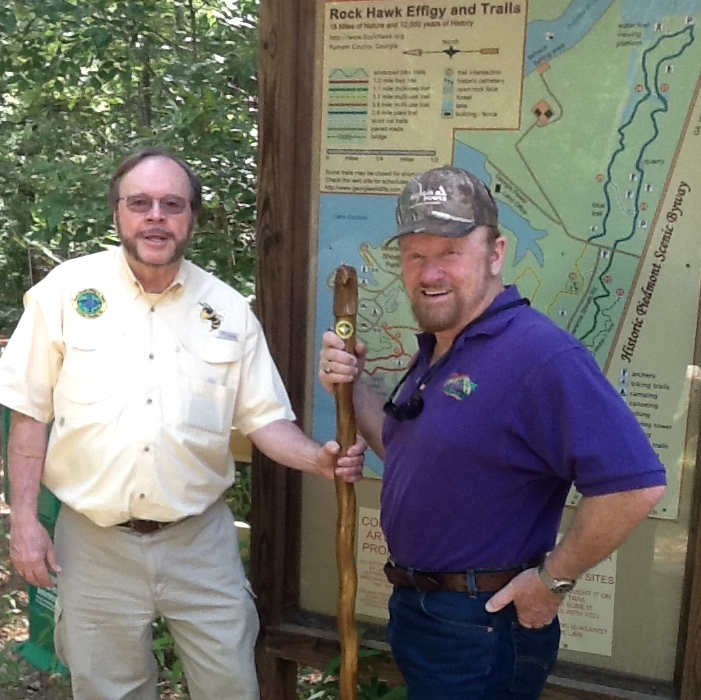 O’Neill Williams (right), host of the nationally syndicated O’Neill Outside TV & Radio Shows (audience of over 170 million), visited Rock Hawk in late May, 2015 for a TV promotion for Georgia Power Co. O’Neill interviewed his old friend of over 50 years, Larry Moore (left), on the Rock Hawk attractions. 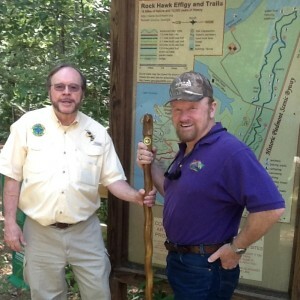 Georgia Power and Moore, representing Rock Hawk, presented O’Neill with one of the hand carved Rock Hawk hiking sticks, which he used on a short hike with Moore, Mark Gordy of Georgia Power and Tom Budnik of DNR. After the hike O’Neill and the TV crew videotaped the Rock Hawk area for another two hours. O’Neill stated that Rock Hawk was a worthwhile destination for the entire family and he was embarrassed that he had not visited earlier. Join us every Tuesday at 6:30pm at the Blue Trail for a running, hiking, or biking event.